About Taiwan Located at the western edge of the Pacific, Formosa, “the beautiful island,” was inhabited by the aborigines before 17th century. When it comes to aboriginal tribes in Taiwan, we would like to say Taiwan is best at preserving a variety of cultures and heritages. You can find several delicate temples everywhere and people celebrating festivals in their special ways. In addition, with magnificent mountains and stretching coastlines, there are enormous number of activities you must try such as river tracing, snorkeling and rafting. Come and explore our mysterious sceneries and cultures personally! While cultures and sceneries play a big role in Taiwan, the cuisine here is definitely a must try as well! If you are worrying about what to eat, night markets can be a good choice. There are numerous mouth-watering cuisines such as stinky tofu, bubble milk tea, and fried sweet potatoes. Come and try our awesome food! You won’t be disappointed by it. In addition to the numerous tourist attractions and cuisines mentioned above, the truly heartwarming Taiwanese is the most crucial reason that why you must visit our country. They will always impress you with their cordiality ! TRAVEL VALIDITY DATES: 21-JUL-2019 to 14-AUG-2019 We look forward to welcoming you on board! About Taichung City Besides	Taipei	city,	Taichung	city,	the	birthplace	for	Bubble	tea,	is	the	city	that	combines	the	hustle	and	bustle	with	fruitful	cultures. Situated	at	the	most	crucial	geographic	location,	Taichung	is	the	heart	of	central	Taiwan,	boasting	vibrant	tourism,	abundant	cultural	resources,	history,	natural	sceneries,	innovative	industries,	recreational	facilities	and	of	course	diverse	cultural	showcases,	events,	delicacies,	shopping	centers	and	more. Wherever	people	gather,	the	culture	of	a	city	is	formed	combining	both	art	and	humanity. Taichung,	whose	fine	arts,	music,	theater	and	modern	art	enrich	the	senses	and	nurture	the	spirit. Not	to	mention,	Taichung	is	a	metropolis	that	is	surrounded	by	nature. The	west	coast	is	about	50	kilometers	long	and	has	sandbanks,	stony	beaches,	wetlands,	and	tidal	zones,	where	the	rising	and	ebbing	of	the	tide	nurtures	a	rich	natural	ecology. In	the	east	there	are	mountain	ranges	and	forests,	full	of	wildlife	and	covered	with	lush	vegetation,	where	high	quality	fruit	and	vegetables	are	grown	all	year	round. Visitors	can	visit	both	the	mountains	and	coast,	explore	the	beauty	of	nature,	and	enjoy	a	relaxing	LOHAS	trip. The	entire	city	is	just	like	a	large-scale	playground	where	the	sun	always	shines! Transportation Main	Airports	for	you	to	know... Taoyuan	International	Airport,	the	main	airport	in	Taiwan	with	full	system	of	multiple	kinds	of	transportation	to	take,	inclusive	of	MRT,	high	speed	rail,	train,	and	bus. Taichung	International	Airport,	the	closest	airport	to	the	venue. With	convenient	bus	system	that	you	can	get	to	the	city	center	of	Taichung. How	to	get	to	Taichung/Venue OC	buses,	we	have	arranged	free	scheduled	buses	based	on	the	information	you	provide	to	pick	you	up	from	Taoyuan	International	Airport	and	Taichung	Railway	Station. High	Speed	Rail,	which	might	cost	you	30	NTD	from	airport	to	Taoyuan	HSR	station,	and	540	NTD	from	Taoyuan	HSR	station	to	Taichung	HSR	station. From	Taichung	HSR	station,	the	most	convenient	and	efficient	way	for	you	to	get	to	the	venue	is	to	take	bus	No. 159	to	Chung	Shan	Hall	station	with	free	cost	by	using	Easycard. Transportation	in	Taichung	City Bus,	particularly	in	Taichung	city,	itâ&#x20AC;&#x2122;s	free	to	take	bus	by	using	Easycards within	the	distance	of	10km,and	remember	to	swipe	your	Easycard while	getting	on	and	off	the	bus. U-Bike,	by	using	Easycard and	registration	of	membership,	it	is	free	to	use	in	30	minutes	and	will	charge	afterwards. Uber/Taxi,	which	is	totally	convenient	and	not	expensive	to	try	in	the	entire	Taichung	transportation	system. Taxi	phone	numbers	for	you	to	dial: Taiwan	Taxi	Cooperation	55688 Taichung	Metro	Taxi	Co.	55178 Car	Rents/	Motorcycle	Rents,	which	you	could	rent	your	own	car	and	make	this	trip	an	unforgettable	one	depends	on	your	own	route	and	moods! Venue:	China	Medical	University China	Medical	University	(CMU)	was	established	as	China	Medical	College	on	June	6,	1958	and	transformed	itself	into	China	Medical	University	in	2003. It	is	the	first	academic	institution	in	Taiwan	where	Chinese	medicine	and	pharmacy	programs	were	offered. The	university	has	steadily	grown	to	its	present	position	as	one	of	the	foremost	medical	universities	in	Taiwan. The	university	has	two	major	campuses,	Taichung	(including	Wuchuan and	Ankang)	and	Beigang. Located	in	the	center	of	Taichung	City,	CMU	includes	7	colleges	where	western	medicine,	Chinese	medicine,	pharmacy	(including	Chinese	herbs),	health	care(including	nursing),	life	sciences,	management,	and	public	health	educational,	research	and	practice	programs	are	provided. Interdisciplinary	courses	are	also	available	as	a	basis	for	students	to	integrate	their	learning	experiences. With	CMUâ&#x20AC;&#x2122;s	top	ranked	laboratories,	a	library	and	reference	center,	two	comprehensive	teaching	hospitals,	and	a	strong	staff	commitment	to	students,	our	university	provides	a	total	approach	to	medical	education	in	a	caring,	nurturing	and	well-equipped	environment. Food	&	Coffee	breaks Breakfast	will	be	offered	in	the	hotel. There	are	other	several	traditional	breakfast	shops	options	for	you	as	well. Lunch	and	dinner	will	be	served	at	the	venue. We	also	offer	Halal	food	and	Vegetarian	food	options! The	drinks	and	snacks	for	coffee	break	will	be	provided	all	day	long. Cookies,	cakes,	fruits,	coffee,	teas,	and	bubble	milk	tea,	a	food	paradise	while	youâ&#x20AC;&#x2122;re	brainstorming	during	sessions! Social Program Pre- PreGA Tour (Day0) The Lin family living in the Azhaowu areas (now the downtown area of Wufeng), was one of the most powerful families during the 19th and 20th century. Built hundreds of years ago and now a national-designated historical site. Come and enjoy the historical, picturesque artificial landscape with professional guides! Welcome Party(Day0) 18TC, a popular nightclub in Taichung which might vent your feelings! Preparing fantastic music, wonderful cocktails with ecstatic atmosphere to meet new friends. All you need to do is emerge yourself in the vibe with the beats. Be bold and chill, enjoy your time with new friends! Yizhong Night Market Tour (Day1) 10 minutes walk away from the venue, Yizhong night market meets our eyes. There are reasonably-priced delicacies, some entertainment, as well as handcrafted accessories and clothes for anyone. Besides, ChungYo Department Store is just right around the corner, which provide tourists with another choice for shopping! We will provide a â&#x20AC;&#x153;must-try foodie mapâ&#x20AC;? for each participant to discover our beloved night market! Come and become an explorer for your hunger centre! Yum! Social Program City Night Tours (Day2) You may travel on your own by the detailed information we provide in the handbook, or follow our local steps of OCs in the tours we planned, which consist of three leisure and enjoyable routes, the hipster, the train station, and the NTT theater. Join us and explore the spots, lots of traditional delicacies, and the profundity of Taiwanese/ Taichung culture. n Route 1: Old city, see the history of Taichung city from visiting the train station and the stores around since WW2. n Route 2: Art and literature zone, feel the mixture of culture and art in this exquisite area hidden inside the city. n Route 3: The NTT theater and department stores, visit the famous opera house in Taiwan and have a casual shopping time. Bar Tour (Day3) Taichung is more than a hub of transport and industry. Well-known for its vigorous nightlife, it is characterized by the booming bars catering to all kinds of drinker, which makes its after-dark fun so fascinating and electrifying. Looking for a place to enjoy some cocktails or beers? Don’t miss our recommendations and maybe you will even get a special discount!! Closing Ceremony Taken place in UniQueinn, we take you to experience the famous “Bando” (辦桌)/ Catering culture in Taiwan as well as providing you with performances of local music and bands. Ensuring every attendant that you can feel the most of love and support by enjoying time with fellows from same workshops with nice cuisines, but also enjoy this exotic unforgettable night. In addition to all the social programs at night, we have also planned more cultural highlights for you to try at noon. There are three topics of cultural stuffs you can can experience every day during lunch time. Chinese Medicine Culture Explore(Day1) You can take a visit to LiFu Museum of Chinese Medicine, which is the earliest established Chinese medicine museum in Taiwan and the feature of the Chinese Medical University. Also, you can make your own “Herbal Tea Bags” by learning the knowledge about Chinese herbs and DIY-ing your own herbal tea bags and bring it home. The coolest part is to experience acupuncture and other traditional Chinese therapies like tuina, cupping, and scraping. Acupuncture is one of the oldest Chinese healing art involving the insertion of sterile needles into acupuncture points to stimulate the healing of the body. Tuina is like an unique form of massage based on traditional Chinese medicine, while cupping and scraping can both promote blood circulation and aid your body through different means. Learning about the mechanisms of them, you can also try if you need. Come, heal your body and heal your spirit! Traditional Chinese Food Explore(Day2) Food in Taiwan is a mash-up of cuisines from a variety of countries, communities and cultures. Among diverse cuisines, traditional food outstands other exotic dishes speaking of symbolizing the daily lives of a Taiwanese. In this section, don’t hesitate to taste them and even try to make them by yourselves! We’ll provide Bubble Milk Tea, shaved ice with plenty of side ingredients for you to add. In addition to Sweet Potato Balls and also teach you to make your own customized Popiah! Come and join us and please your stomach! Aboriginal Culture Explore(Day3) Taiwan, an exquisite and beautiful country, with a variety of ethnic groups such as aborigines and people from different provincial origins. Among them, the aboriginal people have settled down in Formosa(an ancient name of Taiwan during the 17th century) for hundreds of years. After more than 500 years of development, they’ve developed amazing traditions and special cultures. Tayal(泰雅族), the biggest aboriginal group in central Taiwan, is our main feature for the third day side event. By enjoying rice wine and salted pork, you can experience the culture of long-developed tribe. Furthermore, we have invited students of school club as narrators to exhibit another aboriginal group, Paiwan(排灣族). 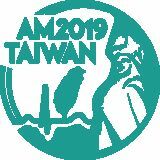 Since you will get to know two of Taiwanese aboriginal groups during this lunch break, it’ll be a great opportunity for you to gain great memory and take part of it! Option 1.– Airport MRT + Taiwan Railway After	arrival,	you	will	receive	your	customized	EasyCard from	our	OC	desk. Hop	on	Taoyuan	Airport	MRT	(B2	in	departure	hall)	and	head	to	Taipei	Main	Station. It	takes	around	40	minutes	to	Taipei	main	station. We	have	OC	there	to	guide	you	to	take	the	Taiwan	Railway	(South	bound)	to	Wanhua station	(just	1	station	from	Taipei	Station),	where	our	venue	is	located	at. If	you	are	going	to	arrive	between	2200	0600,	24	hrs airport	shuttle	is	available	for	you.Follow the	“Airport	Bus”	sign	to	the	platform,	you	can	take: Kuokuang line	1819	to	Taipei	Main	Station， 15~20	min/shift Ticketing:	Bus	counters	on	1F	&	B1(Note:	Find	the	one	that	says	Kuokuang Motor) Pick-up	point: T1:	Bus	pickup	zone	at	B1	Arrivals(#5	stop) T2:	Bus	pickup	zone	at	the	east	arcade	of	the	1st	floor	Arrivals	lobby	(#3	stop) It	takes	55	minutes	to	the	terminal	stationKUO-KUANG	Bus	Taipei	Station. When	you	arrive	Taipei	Main	Station,	you	can	take	Taxi/Uber	to	our	hotel	Caesar	Metro	Taipei (凱達大飯店). You	may	also	pay	extra	to	take	a	taxi	if	you	wish	to	reach	the	hotel	Caesar	Metro	Taipei (凱達大飯店) directly. l Our	GA	venue	is	easily	accessible	by	public	transportation. You	will	find	OC	desks	from	0700	to	2400	at	Songshan Airport	(TSA),	Taoyuan	International	Airport	(TPE)	and	Taipei	Main	Station,	guiding	you	to	experience	excellent	public	transport	service	in	Taiwan. l No transportation allowance will be provided except for the arrival day and departure day. Make sure you update your transportation detail before 1st, July, 2019 through registration platform. l For PreGA participants attending GA, we will start transporting you to GA venue from 9am. Similarly, youâ&#x20AC;&#x2122;ll need to update your time preference for transportation before 1st, July through registration platform. Make sure to check out by 10am. Songshan Airport To get to the venue from Songshan airport, there are MRT, buses and taxi to choose from. Yet, due to the busy traffics in Taipei city, especially in rush hours, it is better to take the City MRT. Songshan airport station is on the BR (Brown) line and you need to transfer to the BL (Blue) line at Zhongxiao Fuxing station to reach the hotel, which is near Longshan temple station. GA Venue Great Skyview Hotel Located in Wanhua, the old Taipei district, Great Skyview Hotel is exactly where traditional Taiwanese culture and modern city vibe meet. 13F - 15F will be the floors for most of the activities of AM19. the design and the landscape of each conference room is going to impress every delegates. On 13F, the dining area is 6 meters high and has no pillar, thus making the whole room spacious and magnificent. The carpet is decorated with peony flower, which not only is the symbol of wealth and being auspicious in Traditional culture, but is the regional flower of Wanhua district as well. 14F and 15F are where most sessions will be held. Each room features unique characteristics: one is having a group of fish made from hand blank colored glass hanging from the ceiling, another has a view on skyline, Tamsui river and Taipei 101 from itâ&#x20AC;&#x2122;s huge French windows, and another is simply decorated with lines and geometric patterns. Moreover, the transportation is more than convenient. It only takes less than 5 minutes to walk to Caesar Metro Taipei (the accommodation), MRT Longshan Temple Station as well as numerous historical monuments. We are sure Great Skyview Hotel is going to bring you an unforgettable conference experience. GA Accommodation Caesar Metro Taipei We consider The Caesar Metro Taipei to be the most comfortable and convenient hotel for the August meeting 2019 in Taiwan. A total of 745 well-designed guest rooms, 2 Chinese/Western restaurants, ballroom with 7.2 meters high ceilings serving as plenary hall will surely bring you delightful accommodating experiences. The Caesar Metro Taipei has a total of 745 non-smoking guest rooms located from the 8th to 30th floors. The modern rooms are in three design styles: light industrial, luxurious, and elegant, to visually satisfy delegates through a variety of themes. The dining area is also innovative, with large floor-to-ceiling windows encircling the spacious area and the buffet stations piling with all types of exotic cuisine. Among the dining area is Bar 98, which offers classic wines, numerous cocktails, and exquisite snacks from 11:00 to 22:00. Its stylish metropolitan atmosphere is suitable for enjoying moments with friends. In addition, if you are seeking for other relaxation besides Bar 98 at the end of the day, an outdoor swimming pool(7:00~21:00)and fitness gym(6:30~22:00) are provided at 8th floor. Moreover, Caesar Metro Taipei focuses a lot on energy saving and carbon reduction. Numerous green building materials are used, such as Taiwan environmental friendly bathing amenity “O’right”, natural lighting design, water saving certified facilities, energy saving lighting and air-conditioner energy saving system. Honored to be awarded “EEWH Gold Certified Green Building”, Caesar Metro Taipei is going to show you ways Taiwanese people practice environment protection! Travelers always image the city before arrival. Whether the streets of the night are gorgeous? If the markets are still crowed in rainy days? Is the first sunshine in foreign land warm and pleasant? Our venue and accommodation are in the twin towers, connected with bridge. They are going to fulfill your imagination. Vegetarian	and	halal	food	options	will	be	available	at	each	meal. Additionally,	a	map	will	be	provided	in	the	survival	kit	to	give	you	information	about	nearby	restaurants	for	group	dining	around	hotel	(coffee	shops,	local	well-known	stands,	dumplings,	etc.). Manga	Night	Market,	which	is	located	near	the	hotel,	is	a	must	for	tourists	to	visit. It	prides	itself	on	the	rich	culture	and	mouth-watering	delicacies. Taiwanese-banquet meals: Taiwanese banquet plays an essential role in Taiwanese culture. Its unique form and diverse food own special meanings that represent good fortune and blessings. We believe that through tasting Taiwanesebanquet food, people cannot only satisfy their appetite, but also enjoy the culture to the fullest. Hakka-flavored meals: Hakka people stand as one of the ethnic groups in Taiwan. They are often thought of as diligent and hardworking people, which directly influences their food. People usually find themselves fascinated with the flavor and texture of Hakka food. We hope that Hakka food can depict a picture of a part of Taiwanese culture. Aboriginal-flavored meals: Aboriginal-flavored meals are basically consisting of food found in the nature. Itâ&#x20AC;&#x2122;s strong flavor and unique cooking way make it different from others. People living in Taiwan can never get bored of aboriginalflavored meals such as wild boar meat and bamboo rice. We invite you to enjoy the special flavor of aboriginal food in Taiwan. Enjoy	all	styles	of	feasts	when	you	visit	our	beautiful	island	which	is	abundant	of	tasty	gourmet! For	any	dietary	needs	or	food	inquiries,	please	state	that	in	your	registration. Science, Technology, and Innovation for Sustainable Health Care Aligned with IFMSA’s Global Priorities, medical students’ responsibilities as future doctors and health leaders should not be limited to curing illness but also include promoting health, preventing illness, reducing health inequities and improving access to healthcare. In light of the digital revolution, medical students should be aware of the changing roles of doctors and the importance of humanity in patientprovider relationships. Access to Research and Research Education To increase the awareness for the importance of early exposure to medical research for medical students through campaigns, promotions, and other means: ICTs are powering a revolution in digital learning, which can help in promoting open access to research resources. Theme Event One Is AI going to replace doctors , or even rule the world? Do AI in fact enlarge the gap between the rich and the poor? Imagine how can AI make a convenient and trendy life? Through this session , we not only want to dig into the changes AI might contribute to , but we also aim to sparkle ideas among participants to come up with innovative solutions ! If you are interested in how the inequity in medicine and education silences voices and basic human rights in every remote area, and are keen to make some changes in this situation , you can never miss this session! Global Health Education Global health is an area of study, research, and practice that places a priority on improving health and achieving equity in health for all people worldwide. In light of the digital revolution, medical students should be aware of the changing roles of doctors and the importance of humanity in patientprovider relationships. “How can technology bring more sustainability to this world?” Since Artificial Intelligence (AI) is now in the trend, we wonder if the merits AI brings can balance out the lurking ethical issues of it, and whether we human beings are able to face the upcoming challenges either in the medical field or any other aspect of society. Theme Event Two Do you want to know what kind of technology is associated with healthcare is presented on the market right now? Or do you want to dig into the technology's’ integration with medical education and medical research? We are going to provide you a highly interactive session with symposium following by a program-based learning! The session would follow the red-hot principles of non-formal education with a suitable level of interaction with participants, following the 4MAT method. We would like to invite several speakers from different field; each of them would represent different perspectives, which give us a fresh chance to discuss this topics from different angles. We are all the next generation of knowledgeable medical students who can take on leadership roles and act as game changers in their own respective communities with regards to healthcare provision. Hereby, we kindly invite all the delegates to participate in the theme events. Let’s brainstorm how integrating various forms of technology into daily practice! Can’t wait to have some chill at the first night of GA? After attending the opening ceremony, we’d like to invite you to join Can’t wait to have some chill at the first night of GA? attending theparty. openingCatching ceremony, we’d ourAfter welcoming up with like to invite you to join our welcoming party. the old peers and meeting new friends, Catching up with the old peers and meeting news friends, welcoming party provides you ayou superba superb welcoming party provides opportunity to update or strike up an opportunity to update or strike up an international friendship with GA folks in the very beginning of the August meeting! Party drinks andfolks in international friendship with GA desserts are all available, and the welcoming party the very beginning of the August meeting! is just at the same place as the opening ceremony, come have a blast! Partyanddrinks and desserts are all available, come and have a blast! We believe NFDP is the most popular event and highlight for delegates. Not only is it a precious chance to savor exotic delicacies and snacks from numerous countries but a perfect time to present your own cultural food! Important things you should pay attention: l State your alcohol concentration on the bottle, Taiwan has imposed a strict ban on meat products from countries affected by the highly contagious African Swine Fever (ASF) Virus. l We advise you DO NOT bring any MEAT PRODUCT even it is only snacks! Over 5000 Euros will be fined at the declaration counter. l Weâ&#x20AC;&#x2122;ve also prepared induction stove this time, so no worries if you need to heat something up to amaze the delegates! l Drink smart. According to the rules and regulations of the venue, the penalty notice of vomiting in the party hall costs 250 Euros. Take care of your members! l We prepare rest zone for you at the entrance. Taiwanese Tea, water, napkins will be available. Come to chill with Jasmine whenever you feel uncomfortable ;) l The party officially ends at 2:00 am. The shuttle bus will be dispatch every 20 minutes during the party. l Go and wander through all the booths and explore different culture by filling up your stomach, we guarantee you a fabulous break nâ&#x20AC;&#x2122; fuse night! DAY2 Night Tour Wondering what a beautiful Taipei night look like? At this night, we offer an elaborate local tour for you to start off an unique adventure. With the map, you need to explore the route and find out our checking stops in the neighborhood of Longshan temple, one of the historical centers in Taipei, all by yourself. After checking in, our guides at each stop will tell you some city legends or cultural information regarding the location! Do make sure to join the night tour and unveil the night of Taipei! DAY3 Taiwanese Night Being	the	host	of	August	meeting	2019,	we	are	ready	to	treat	you	with	an	unprecedented	marvelous	feast	under	the	theme	of	Taiwanese	culture. Putting	all	the	Taiwanese	factors	together,	you	are	able	to	watch	the	Taiwanese	cultural	shows,	savor	palatable	Taiwanese	food	and	learn	more	about	this	country	by	playing	orientational games	all	at	the	same	time!! Whatâ&#x20AC;&#x2122;s	more? Delicate	prizes	and	snacks	vouchers	are	always	there	for	game	winners! Please	come	join	us	and	create	your	one	of	a	kind	Taiwanese	experience! DAY4 Cultural Night Probably the most exciting event for those who canâ&#x20AC;&#x2122;t wait to sing and dance! This night is a multicultural party where delegates can go on stage and give a performance to everyone. Be it a conventional dance or modern fashionable one, watching the shows prepared by different countries is undoubtedly a once in a lifetime opportunity to learn different cultures. Ready to ignite the night with your passion and high spirit? Just come and join the shows! We also provide an all you can drink bar to make your night irreplaceable. DAY5 Closing Party Having such a great memory in GA, we organize a closing party for you to wrap up this unforgettable journey at the last night. Please seize the last chance to get the contact information of GA folks to stay in touch and bit all your friends a nice farewell. Again, beverages and desserts will be provided. Letâ&#x20AC;&#x2122;s gather together and make it a remarkable ending! In Taiwan, many hospitals, businesses and foundations all dedicate to improving health sustainability and developing medical technologies. We invited them, from doctors to managers to CEOs, to introduce the detailed information to you! NGO Exhibitions NGO Exhibitions of topics related to SCORP, SCOPH, SCOME and SCORA, will show you how many efforts our local committees have made this year in Taiwan. Traditional Taiwanese Art We will hold six exhibitions of different fields for	you	to	enjoy	the	beauty	of	Traditional	Taiwanese	art	in	person. So	you	may	wonder	what	are	our	topics? that’s	a	secret! We	will	announce	related	information	in	days	before	the	GA,	please	do	not	miss	it! Our members will introduce you the stories about Chinese Medicine and Medical History in Taiwan. Sounds boring? You will definitely regret in case you don't participate, cause Human library is the most effective way to learn about the history in the country you aren’t familiar with! Taiwanese Food Stands What are the best part in Taiwan? Food, without a doubt! We serve various food, from sweet to salty and from hot to cold! So of course, don’t miss our food stands, we are sure to let you get full every single day in the GA with abundant food choices!!! Experiences for Chinese Medicine Chinese Medicine is always a mystery to you, so to us!!! So why not we explore the beauty of Chinese Medicine together? Our members will guide you to analyze the nature of your body, then they will introduce some medicinal herbs that fit your condition. After you pick the herbs you want to have, you can grind them by yourself, creating a customized medicine! Creative Markets by Taiwanese designers Besides what we mentioned above, we sincerely hope all of you can bring something back to your country. So we cooperate with local designers, who use the beauty of Taiwan to create their art works. Undoubtedly, these souvenirs will be one of the best part in your trip to Taiwan. To	enjoy	the	exciting	trip	in	Miaoli,	time	to	visit	the	Ramune Marble	Soda	Factory! We	planned	to	have	some	outdoor	activities	too,	an	attraction	called	Old	Mountain	Line	Rail	Bike	allows	us	to	ride	on	bicycle	all	the	way	from	Sheng-Hsing Train	Station	to	Long-Teng Bridge	and	it’s	about	3.6km	apart. Next,	we	are	going	to	visit	Sanyi Wood	Sculpture	Museum,	a	great	place	to	take	a	break. The	attraction	in	Hsinchu	will	be	Neiwan Old	Street,	Colored	Glass	DIY	Studio	and	Beipu Old	Street. It’s	time	to	visit	Taoyuan! The district surrounding old Taichung Train Station used to be the most busiest place but has declined gradually. Some cultural workers transformed the old building into innovative dessert store, Miyahara Ophthalomology, one of the most renowned dessert shop in Taichung, which is famous for its antique buildings and the meticulous decorations. By taking historical trains, you will arrive to Alishan, the most wellknown natural attraction. Route 6—— 5D4N Penghu(5 days) To explore Penghu that is rich in stone weirs, the first attraction we are going to visit is Qimei Twin-Hearts Stone Weir. As Penghu has a name “The Beauty of Maine World”, Kuibishan Geopark seems to be a mustgo place. Make sure you take a close look at these unique basalts and see how they are different from normal stone. In August, it will be canicular day and what we can do is to eat Cactus Ice! At night, it is suitable for night fishing. What you have caught could be your mouth-watering dinner! At place that is surrounded by the sea, Jibeiyu is a heaven for water activities, housing various types of recreational activities, including banana boat, paragliding, snorkeling and so on. What can be more interesting than this trip? Registration Fees The registration will be done using the same platform as the IFMSA August Meeting 2018. 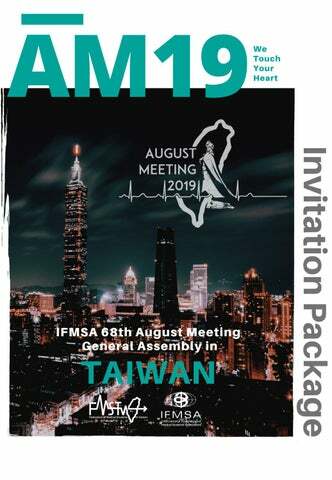 Personal invitation letters will be available on the website upon completing the registration process and being approved by your head of delegation or IFMSA EB (quota out of general delegates). Each national member organization (NMO) is guaranteed a quota of up to 16 delegates, 8 eligible for early fees and 8 eligible for late fees. Please note that if a delegate registered after the early fee deadline, they shall pay late fees. Additionally, the Organizing Committee guarantees early registration fees for: a) A minimum of 8 delegates for every NMO. b) all IFMSA Officials outside the NMO quota (for the August Meeting this includes the elected Executive Board members) c) all IFMSA staff members. d) 1 representative from each IFMSA Programs outside of the NMO quota, as long as they do conform to the IFMSA Bylaws. e) 2 members from the hosting National Member Organization(s) of the next General Assembly Meeting outside of the NMO quota. f) the coordinator from each IFMSA Task Force, outside of the NMO quota. If the coordinator of an IFMSA Task Force cannot be present at the General Assembly, a general member of the Task Force can be appointed to take this spot. g) 10 support persons appointed by the EB, outside of the NMO quota. h) 6 support persons appointed by the Standing Committee Directors, outside of the NMO quota. i) 2 plenary team members, outside of the NMO quota. j) 3 International Assistants per Standing Committee appointed by relevant Standing Committee Director. k) 1 International Assistant per Region appointed by relevant Regional Director. The Organizing Committee guarantees late registration fees for: a) Up to 8 delegates for every NMO. b) 6 support persons appointed by the Standing Committee Directors, outside of the NMO quota. c) 5 support persons appointed by the Regional Directors, outside of the NMO quota. d) At least three members of the Financial Committee, outside of the NMO quota. e) 3 International Assistants per Standing Committee appointed by relevant Standing Committee Director. f) 1 International Assistant per Region appointed by relevant Regional Director. Additional information: Delegates from C&D and E&F must respectively pay 10€ and 25€ for the Travel Assistance Fund. Delegates beyond the NMO Early Quota (8) must pay an additional tax of 25€ for the IFMSA central budget. NMOs with debts toward previous OCs will not be invited to the AM19, as per the bylaws. According to the banking policy, every wire transfer will cost a 10€ banking charge. For saving the extra cost, it's strongly recommended to transfer the registration fees for your delegates in one transfer and to the bank mentioned below. Should your NMO not be able to do bank transfers, please contact us by April 15th, 2019 at am2019.treasurer@fmstw.org. We will work on a solution together to facilitate the process. Visa Requirements eVisa applicants must possess an ordinary, official, or diplomatic passport with validity of at least six months as of the date of intended entry into Taiwan. Thus, participants must be equally committed to comply with early deadlines and monetary expenses that might be needed in order to obtain said visa. To obtain eVisa, applicants must submit relevant personal information through the registration platform and pay the required fee by credit card (Visa or MasterCard) online. Republic of China overseas missions may, depending on the applicantâ&#x20AC;&#x2122;s nationality and purpose of visit, request through email. If these requested additional documents are not submitted by the given deadline, the application might be denied. While the OC will do everything in its power to provide timely information and to facilitate processes for international delegates, it is important to understand that the due process of visa applications will need to be respected and that we are not able to guarantee that all participants will be awarded visas as this is contingent on your previous travel and criminal history. An official invitation letter will be available for all delegates once they are registered and approved. You may refer to the link for further information. Please be aware that information presented hereafter are for general information only and do not at any time replace the information available on Bureau of Consular Affairs, Ministry of Foreign Affairs of Taiwan website or any of the information provided by an officer of a visa office from the following link. Please note that, Holding Cambodia, India, Indonesia, the Philippines, Vietnam passport with valid visa or permanent resident certificate issued by U.S.A., Canada, Korea, Japan, U.K., Schengen Convention countries, Australia or New Zealand do not need visa to enter Taiwan. If not, it means you need visa to enter Taiwan. Before arriving in Taiwan, you can complete an immigration arrival card online here or request it on flight to avoid from long queue at the custom. Please note that, Holding Cambodia, India, Indonesia, the Philippines, Vietnam passport with valid visa or permanent resident certificate issued by U.S.A., Canada, Korea, Japan, U.K., Schengen Convention countries, Australia or New Zealand do not need visa to enter Taiwan. If not, it means you need visa to enter Taiwan. Suggested Timeline April 2019 l Consult the following link to confirm whether your country requires a visa. l Registration will open by April 15th, so NMO President can quickly start approving your delegates (early and late). May 2019 l For NMO President, make sure you pay by May 25th to complete early registration. l If your visa is approved, we will issue you Evisa code though registration platform. l Invitation letters will be available once the delegate is registered on the platform, and is approved by their NMO or IFMSA EB. l We advise NMO needing visa to approve your early and late delegations together before 15th May so you and your delegations will have all e-visa code during the first application. l For late registration, if you need a E-visa code from the OC, make sure you register before 30th May. June 2019 l June 15th is the deadline to register for AM2019 l For NMO President, make sure you pay by June 25th to complete the late registration. l If your visa is approved, we will issue you though registration platform. Double check your passport number and name submitted. l Book your flight! l You can start to fill in the required information in 1st of July to finish your eVisa Application form from the following link. l We have proper guideline to assist you to fill in your eVisa Application form. Before Buying Plane Tickets l Register on the online platform and be approved by your NMO. l Apply for a eVisa . l Wait for confirmation that your registration has been paid for by your NMO. l Once your spot is paid and you have your eVisa code, book round trip tickets. l Pack everything you need and everything you would like to share with the whole world. l Do not miss your plane. l Welcome to Taiwan! We Hopeâ&#x20AC;Śâ&#x20AC;Ś l Do start as early as possible! We understand that national guidelines for registration vary from NMOs to NMOs and that participation in a GA can be last minute, but if you require a visa you absolutely need to start the process as soon as possibly. l Do not hesitate to contact Jit Swen at am2019.visa@fmstw.org as soon as you identify a problem where we can help (such as providing supporting documents, invitation letters, justification letters, etc.). We are committed to answer your request as quickly as possible. l Do not wait to the last minute to contact us. As yourself, we are medical students and we have a lot on our plate during our studies and personal life, thus you need to be aware that some requests may take a longer response rate. l Before contacting us for a question specific to your situation, do contact your NMO President, we send monthly update to NMO server every month, not only sharing our working report but also important information. As an independent and smart medical student, you have already searched on the website. If the situation is too specific, we will have anyway to redirect you to the Bureau of Consular Affairs, Ministry of Foreign Affairs of Taiwan office. We aim at holding a GREEN conference. Letâ&#x20AC;&#x2122;s make it happen together! DINING l Say “NO” to disposable tableware Bring your own utensils. We provide rental service at the venue for free, but you will need to wash before returning ;) l Say “YES” to vegetables. It is ecofriendlier and healthier to eat less meat. ACCOMMODATION l Saving energy and water Turn off power supplies and faucets after using them. Set the air conditioning to 26~28°C. l Reducing waste Please pack your personal daily necessities in your suitcases. l Recycling, follow the signs on recycling bins. Wash before throwing them away. TRANSPORTATION l Carbon-offset Choose airlines with carbon-reduction commitments or carbon-management programs. l Take public transportations when touring in Taiwan will be fun ! l Join Us!!! Step1：Prepare	your	second-hand	items. Step2：Put	them	on	our	stand. Step3：Exchange	for	other	items	and	make friends! Step4：Bring	back	your	items	which haven’t	been	exchanged. Currency in Taiwan is the Taiwan New Dollar (1 EUR is 34.9 TWD as of 15 March 2019). Travellers' cheques and all major credit cards are widely accepted and are the best way to carry currency. Whether your credit/debit card can be used international, consult your banking please. Currency may be exchanged in hotels, banks, 24hr in Taoyuan International Airport. We provide currency service in our venue, accepting AUS, CAD, RMB, EUR, GBP, HKD, KRW, SIN, USD to NTD only. Transportation Transportation to the social program venue: We will have volunteers guiding you to experience our public transportation at all the time, Also, we are considering and doing evaluation on providing OC bus at night, however, we encourage you to throw the venue on Google Map, the fact shall let you survive and relax in Taipei. Opening Ceremony - Sheraton Grand Taipei Hotel Take the blue line at Longshan Temple MRT Station, direction Taipei Nangang Exhibition Centre, hop off at Shandao Temple Station after 3 stops. Take the exit 2 and Sheraton is in front of you. NFDP - Amazing Hall OC Bus Schedule will be released in Survival Kit. Cultural Night/Taiwanese Night - Civillion Space Again, take the blue line at Longshan Temple MRT Station, direction Taipei Nangang Exhibition Centre, hop off at Sun Yat-Sen Memorial Hall Station after 7 stops. Take Exit 1 and walk straight about 5 minutes. Party time! The operating hour of Taipei City MRT is 0600 - 2400. From 2400, we will have OC bus working until 0200 to transfer you back to your sweet bed. PRECAUTIONS EATING and DRINKING are strictly prohibited while taking MRT. Tipping Tipping generally isn't very common in Taiwan, although it is appreciated. Taxi drivers expect to return you exact change. Restaurants generally don't expect significant tips. In most of restaurants, 10% service charge is included in the price. Language Though 98% of the population of Taiwan speak Mandarin, there are still many different languages used in Taiwan, including: Hakka, Taiwanese, and aboriginal languages, Learn some Mandarin to earn some friendly smiles on the street! 1. Nĭ hăo 你好 English Translation: Hello Pronounced as: (nee haoow) /niːhaʊ / When greeting people, this is the most basic phrase to say. “nĭ hăo” literally means “You good” (nĭ = you, hăo = good), but typically translates to “hello”. You could use this phrase in greeting locals especially before you ask questions to them. “hăo” means “good” and it also means “ok” too. “Nĭ hăo ma?” means “how are you?”. By adding “ma嗎” at the end, you are now asking a question. 2. Xiè xie. 謝謝 English Translation: Thank you / Thanks Pronounced as: (shhyeah shhyeah) /ʃːje•ʃːje/ Whether you are riding a bus, asking for directions, or ordering food, just say this simple phrase and locals will be really happy to hear it. If you want to be more friendly and polite in saying Thank you, you can even add “nĭ” (you) after “xiè xie”. e.g. Xiè xie nĭ. 3. Tīng bù dǒng 聽不懂 English Translation: I don’t understand Pronounced as: (teeng boo dong) /tiŋ buðoŋ/ Taiwanese people are really friendly. And because of that, they might suddenly talk to you in Mandarin even though you don’t personally know them. So what would you say to them? These 3 words, (tīng = hear, bù = not, dǒng = understand), might be the three most important words you’ll ever learn while staying in Taiwan. 4. Duō shǎo qián 多少錢 English Translation: How much? Pronounced as: (dwo shaow chyen?) /duo ʃaʊ tʃjen/ One of the most popular places in Taiwan are its night markets. It’s almost impossible for a tourist to visit Taiwan without visiting its night market. So you might need to remember this phrase when you buy something. The phrase “duō shao?” (“duō” = much, “shǎo” = few) means “how much? or how many?”, whereas, qián means ‘money’. So yes, you can just say “duō shao?” when asking the price, but for specifics, saying the complete phrase is preferable. 6.Yǒu méiyǒu 有沒有 English Translation: Do you have..? Pronounced as: (yow may yow …?) /jəʊ meɪ jəʊ/ “yǒu méiyǒu” literally means “have or not have” (yǒu = have, méiyǒu = to not have). This phrase is used mostly while ordering in a restaurant. Some local restaurants don’t have English menus and are generally written in Chinese. You can learn some basic Chinese words and say it after this phrase. Example: Yǒu méiyǒu yīngwén càidān 有沒有英文菜單? Pronounced as: (Yow may yow eeng wn tsaiy dan?) English: Do you have an English menu? English Translation: Excuse Me / Pardon / Sorry Pronounced as: (boo haow eeh si) /bu haʊ i sʌ/ When you’re pushing your way off the crowd or when you accidentally hit a local during the duration of your tour, just say this phrase. “Bù hǎo yìsi” literally means “not a good meaning” or “a bad meaning”. But locals usually say this word when they feel embarrassed on doing something, or when they did something stupid. You can also use this phrase before asking them about something. Example: Bù hǎo yìsi, Zhè ge duō shǎo qián Pronounced as: (boo haow eeh si, jey ga dwo shaow chyen?) English: Excuse me, how much is this? English Translation: Restroom Pronounced as: (Tse soo-oh) /tse suəwo/ These 10 phrases will not be complete without learning this word. Tourists may find it really hard to look for a restroom when they are wandering around the streets of Taipei. Most of the restaurants have their own restrooms so you don’t need to worry. But learning this word is essential. Saying this word is not enough for them to understand you. But Taiwanese people can understand you more if you combine “cè suǒ” with the different phrases you learned from above (particularly nos. 8 and 9.) Examples: 1. Wǒ yào qù cèsuǒ 我要去廁所 Pronounced as: (Wo yaow. chyoo tse soo-oh) English: I want to go to the toilet. 2. Cèsuǒ zài nǎlǐ? 廁所在哪裡? Pronounced as: (tse soo-oh dzaiy nah lee?) English: Where is the toilet? 8. Zài nǎli在哪裡 English Translation: Where is…? Pronounced as: (dzaiy nah lee) /ðzai næh li:/ Okay, now you’re lost and you don’t know what to do especially when you are in a place where there’s no internet. As long as you have these 2 words reserved, you don’t need to worry. You can go and ask anyone about a particular place and if you have a map or a picture, you can just point it and say these words to a local Taiwanese. 9. Wǒ yào qù… 我要去 English Translation: I want to go to… Pronounced as: (wo yaow chyoo) /wo jaʊ tʃjuː/ For me, this phrase is one of most important and useful phrases in conversing in Mandarin. Wǒ yào qù (“wǒ” = I, “yào” = want, “qù” = go), then you add a name of a place after these three words. This is very useful especially for asking directions and taking a taxi. Example: Wǒ yào qù Tái běi101 我要去台北101 Pronounced as: (Wo yaow. chyoo tai pei 101) English: I want to go to Taipei 101 As you have noticed, “Wǒ yào” means “I want”. You can learn easy Chinese verbs and nouns as you travel and put those new words you learn after “Wǒ yào“. Example: Wǒ yào zhè ge (I want this). ESSENTIAL APPS FOR TRIP IN TAIWAN? Google	Translate Download: iOS | Android Google	Translate’s best	feature	is	its	optical	character	recognition,	better	known	as	OCR. You	can	just	point	your	phone’s	camera	over	Chinese	characters	and	it	will	translate	the	words	on	the	spot. l Pros:	Google	Translate	can	translate	languages	in	multiple	ways. You	can	use	voice	dictation,	conversation	mode	(this	translates	two	different	spoken	languages),	handwriting	recognition	or	character	recognition. l Cons:	It’s	definitely	not	perfect. Many	words	are	literally	translated,	which	doesn’t	always	come	out	accurately. But	it’ll	help	you	get	the	gist	of	what	a	sign	or	menu	item	means. Google	Maps Download: iOS | Android Where would we all be without good ol’ Google Maps? Probably lost! Google Maps in Taiwan is highly reliable. Get all the walking, train, bus, and cycling routes plus travel time. Just turn on location, input the addresses, follow the blue line, and you’ll get there…eventually. KKday Download: iOS | Android Book more than 10,000 unique activities and travel experiences with the KKday app. It’s easy to do so in the comfort of your own home. Keep an eye out for cool promos like skip-the-line tickets, unique day tours, and enjoy exclusive discounts. Uber Download: iOS | Android This	world-famous	ride-sharing	app	allows	you	the	ease	of	traveling	by	car	without	the	exorbitant	taxi	rates. After	much	controversy,	Uber	is	alive	and	well	in	Taiwan. Uber	is	easy	to	use	and	will	pick	you	up	and	take	you	where	you	need	to	go. With	Uber,	you	can	calculate	your	rates	and	have	them	charged	by	credit	card. No	need	to	fumble	for	change	or	struggling	to	haggle	down	the	fare	in	Mandarin	with	the	driver. GO! Taipei Metro Download: iOS | Android This app is a must-have for travelers in Taipei. It provides all the information you need for traveling Taipei’s excellent subway routes. Pros: Go! Taipei Metro includes information about individual stations, including restroom locations and accessible exits. It also provides pricing information, travel times, transfer information (including wait times) and sightseeing information for each station. Cons: All the information is only in English. You’ll need to download its Chinese counterpart (台北捷運Go) to see the station names in Chinese.